With one of the greatest grins around, pit bulls are the apple of numerous individuals’ eyes. Even though horrendously defensive of their most loved individuals, pit bulls are very well disposed as well. As a pup, a pit bull needs to play throughout the day, consistently and adores collaborating with kids and grown-ups alike. 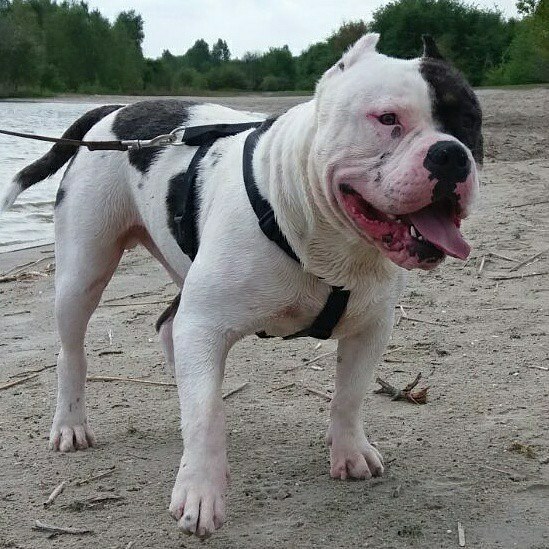 With family from England, Scotland, and Ireland, the pit bull was made by intersection distinctive bulldog and terrier breeds together. Even though initially reproduced for battling expansive creatures, that has since been restricted. They additionally have made superb rodent seekers because of their terrier roots. Size Pit bulls tend to come in medium or large varieties, ranging from 30-90 pounds and 17-19 inches. Breed Characteristics A pit bull is a strong and sturdy dog, with the most defining characteristic being their wide faces. They have a wide, flat head and powerful jaw, with small to medium ears, and a short thin tail. They have a short, fine coat. Other than that, pit bulls don’t have a defined set of colors related to their breed. You’ll find them in anything from steel grey to white with brown patches. All the color varieties depend on what kind of bulldogs and terriers are mixed in with the breed. Temperament A pit bull may be perceived as mean in pop culture, but the natural temperament of a pit bull is quite the opposite. Outgoing and friendly, this stocky dog has a powerful desire to please people. Their powerful jaws do like to chew when they are bored, though, so be sure to keep them occupied and give them plenty of exercise. Grooming and Health Needs Due to a pit bull’s short coat, they need minimal grooming. However, sometimes their short coat can’t protect their skin from skin allergies or mange. For all dogs, be sure to trim nails check teeth regularly. Genetically, pit bulls can suffer from hip dysplasia, kneecap dislocation and degenerative myelopathy. Training Getting a pit bull puppy used to walking with a leash will certainly be a tremendous help. They are driven by prey from a history of ratting and a combination of terriers, so even well-behaved pit bulls can get a little distracted. While on a leash, this is a good opportunity to socialize your pit bull pup. This teaches them to play nice, without running off if they see something they want to catch. Energy Level Pit bulls are a very active breed and require a fair amount of exercise. Having a fenced in backyard where they can play vigorously is ideal so they can get rid of their excess energy. They yearn to please people, so playing games in which they can be rewarded by you while running around would be best. Life Span Pit bulls live between 12 – 14 years on average. Who is the best human for a pit bull? Pit bulls are very well suited for family life. They have been known to be gentle and playful with children, and love being part of an active household. They need a lot of opportunities to get rid of excess energy, so being cooped up in an apartment without access to move around much may yield some destructive behavior. A well-trained pity is a happy pity, so training early on the leash and getting used to dogs and people will set your pit bull puppy up for a fulfilling and joyful life. Choosing to adopt or go through a breeder for your new pit bull puppy is a personal choice that requires research. Thankfully, there are many resources out there to help you find a rescue or breeder that offers healthy, ethically sourced pit bull puppies. Knowing what you’re in for when you get a pit bull puppy is a major step in being a responsible pet owner. Whether you find a responsible breeder or are planning on adopting, it’s up to you to be prepared for an energetic and friendly addition to your household. It may be surprising to know but adopting a pit bull puppy is possible. According to the AKC, most breed rescues report that most of their rescue dogs come from individual owner surrender, with the most common reasons being a change in lifestyle or the breed not being right for them. This means that there may be many dogs and puppies out that that are looking for a new forever home. The main difference between a breeder and a rescue is that a rescue may not always have young puppies to choose from. The benefit, however, is that most are mandated to only adopt out dogs that have been microchipped and spayed/neutered. This means you may end up with a dog that’s already been housebroken and doesn’t need these common medical procedures. You may also find a pit bull mix that has all the traits you want from the breed, but with a little extra thrown in. Finding a pit bull rescue can be as simple as searching the internet. The AKC also has an excellent list of pit bull rescues on their site. The first step is to do your research. Sadly, there are many puppy mills posing as reputable breeders along with many online scams. Be aware and reach out to different online forums for conversations about getting your future furry family member. Be sure to ask questions, decide to meet the parent dogs or mother, and follow your gut. If something seems wrong at a breeder you visit, or the pit bull puppy seems too good to be true, there’s likely something going on. The AKC also offers resources for finding a breeder, with strict guidelines on who they let participate.